Now that DONUTS the book is out (yay!) I thought I'd provide some links to a few of pieces of equipment and specialist ingredients I recommend you get if you're going to try making the recipes. Baking Tray for baked cake donuts. Donut cutter for cutting out yeasted donuts (our original recipe). Mini donut cutter for cutting out yeasted donuts (our original recipe). Digital thermometer for determining temperature of oil when frying yeasted donuts. Dough scraper for slicing through yeasted dough and cleaning up dough-y covered surfaces. Savarin ring tin for the giant vanilla donut cake. Disclaimer: This isn't a sponsored post - everything that's recommended here is because I personally think it's brill and we use it ourselves in the bakery. YEP! We now sell vegan donuts, you guys! The dough is suuuuuuper close to our original - crazy soft, really light, mega fluffy and ultra crispy on the edges. AKA it's so yummy, you gonna wanna try some. Check out our special vegan online shop here or put in a custom request for some vegan D's over here. Valentine's Day is almost here and we'll be on hand to deliver bae a box of donuts this year because a bunch of roses are so 2003, amirite? We have heart shaped donuts and fancy-schmancy rose petal donuts available from our online shop - check them out here! And if your hottie is vegan, dw because we got you covered. Check out our vegan range here. All donuts can be picked up from our bakery in Dalston or delivered within London (for a fee, find out more here). We're now closed until 3 January 2018! All emails and order enquiries will be dealt with after then. Thank you so much to everyone that's supported us this year! Best. Year. Ever. It’s out in Spring 2018 and you can preorder your copy from Amazon by following this link. Huge huge thank you to the publisher Hardie Grant, Studio Thomas for the design and Joe Woodhouse for the photography. It's not every day Instagram get in touch to ask you to speak on a panel at one of their events so when they did, ofc I was like "Ummmm YAS!". The event on Thursday hosted a few independent companies and members of press to celebrate small businesses who use Instagram to accelerate their growth. It was me, Earl of East London, Ethical Stories Ethical Me and Campbell Cole who were asked to speak on the panel to reflect on how much Instagram has helped our businesses prosper. It was great to share our story and to hear the stories of others too. There were a lot of "ME TOO! "s for sure. I'm a major fan girl of Insta and am always more than happy to big it up incessantly to anyone that will listen - from day one it's been an ace way to showcase what we do, whether it's highly stylised photos of fancy donuts that I spend way too much time perfecting or quick Boomerangs of rolling dough on our Stories feed. It's one hundred per cent my fave app to use and has enabled us to reach a customer base I could never have dreamed of before its existence. HEADS UP! I'm frolicking off to NYC on Wednesday 22 November for one week. 🗽🇺🇸🍕 While away, our online shop will be closed and all custom enquiries made from then until Tuesday 28 November will be answered when I get back. Super soz for any inconvenience but this chick needs a holiday innit All planned orders during this time are still going ahead thanks to my lovely donut fairies. Aaaand! If anyone has any recs for the big apple (particularly any kind of food deep fried and covered in sugar) send em my way! Limited tickets available here. See you there! 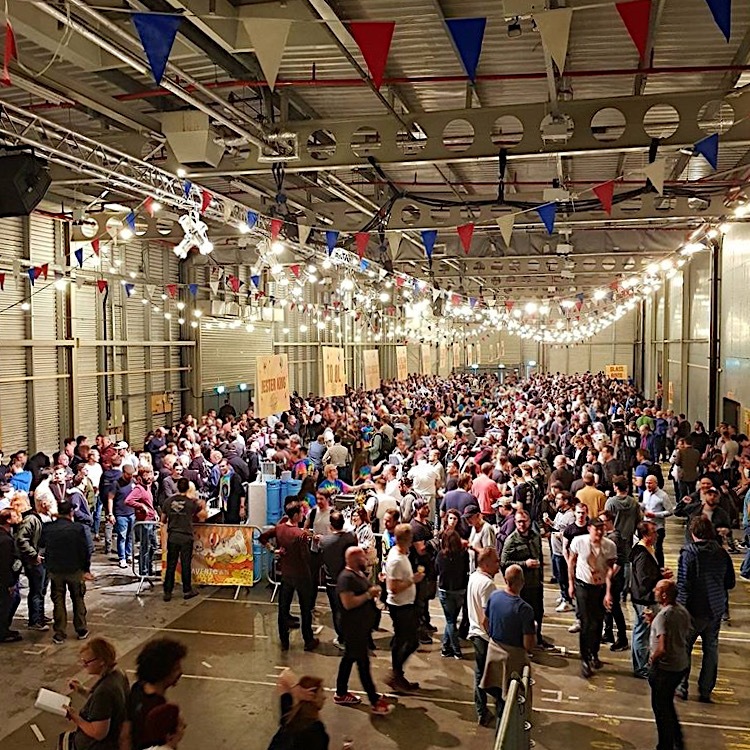 Thank you so much to everyone that visited us at Beavertown Extravaganza this weekend! We went through a crazy 52kg flour, 208 eggs, 2 litres maple syrup, 8kg peanut butter, 825 raspberries, 3500 sprinkles and a lotta lotta beer! Phew! Head on over to the official @instagram page to take a behind the scenes look at all things Vicky's Donuts on their stories for the next 24 hours 🍩🍩🍩 *Disclaimer* may result in many donut-related cravings. 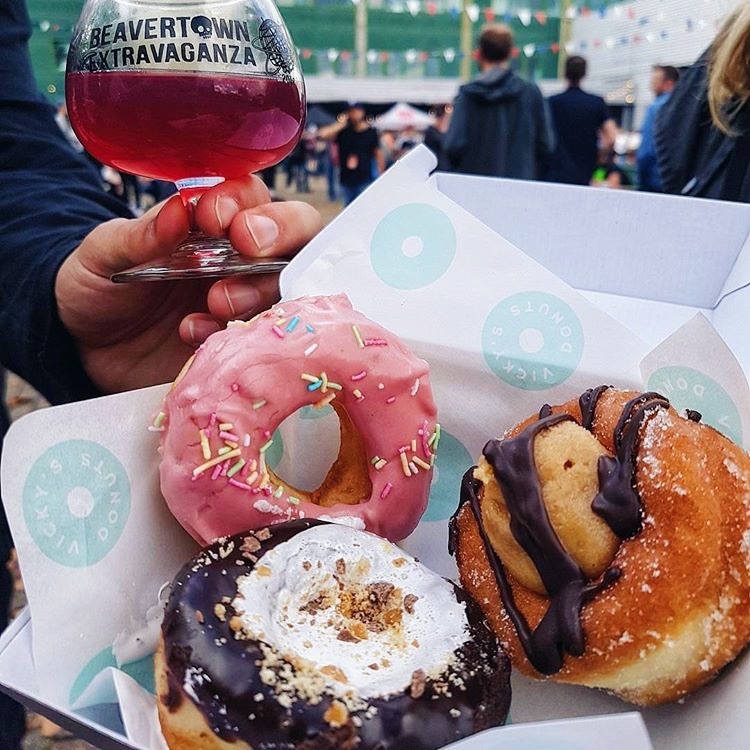 We'll be serving up some shamefully good donuts at KERB's It's Only Arctic Roll But I Like It - on from Friday 21 - Saturday 22 July. Celebrating the best of guiltiest pleasures, think fish & chip with mushy peas in a wrap with a side of curry sauce (Kolkati), Vienetta ice cream (Le Choux and Nonna's Gelato) and my fave, CRISP SANDWICHES from the amazing Project Sandwich. 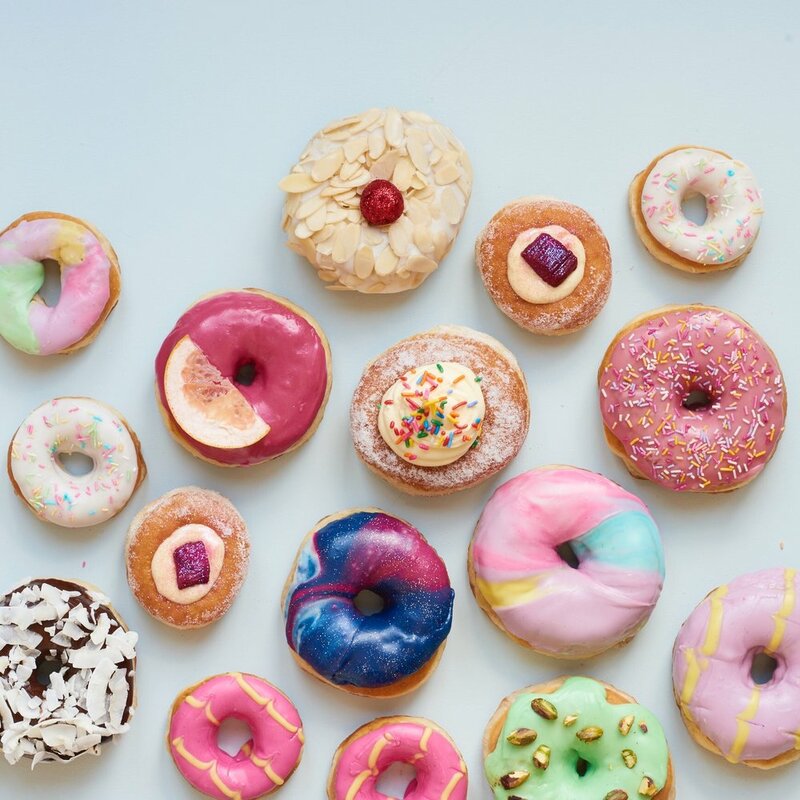 Visit our shop here or you can make a custom order by heading here, a corporate order here or anything regarding an event (because donuts make any party 100% better) over here. Alternatively, you can order some peaky merch over here. I'll be at the brand new Victoria Park Market from Sunday 18 June serving up seasonal donuts and ice cream donut sandwiches! Come on down! I'll be there from 10am-3pm each day.